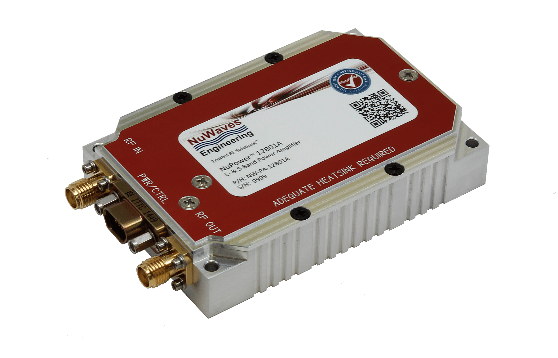 The NuPower™ 12B01A-01 L-Band Power Amplifier is a broadband, high-performance solid-state power amplifier module that delivers at least 11 watts of RF power for CW and near-constant-envelope waveforms in L-band frequencies of 1.0 GHz to 1.5 GHz from a very small package. The NuPower module accepts a nominal 0 dBm input drive level from the transmitter/transceiver and provides 40 dB of gain to generate at least 11 watts, and typically 17 watts, across the entire operating band. 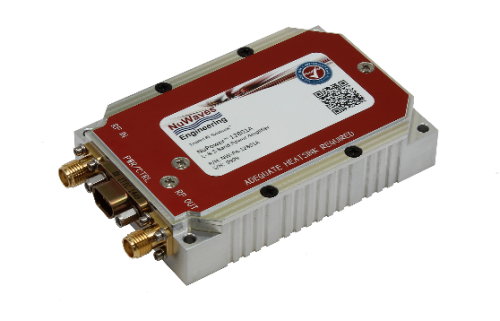 With a small form factor (3.9 cubic inches) and high efficiency operation (30% to 50%) based on state-of-the-art Gallium Nitride (GaN) power amplifier device technology, the NuPower 12B01A-01 module is ideal for broadband RF telemetry and military communication systems that require reliability and minimal size, weight, and power consumption (SWaP).